Here’s a quick cheat sheet to help you understand the main rules. See below for more detailed and complete explanation. Check out my menus with the link below. You can edit them and use them as your own. I hope that helps. Two veggies for lunch or supper, or one fruit and one veggie. Fruits and veggies allowed for infants over 6 months at snack. No juice for infants, no more than one serving of juice a day for 1 and up. At least one serving of whole grains per day. Meat or meat alternate can be served for breakfast instead of bread 3 days a week. Tofu can count as meat alternate. Serve plain yogurt or yogurt with less than 23 grams of sugar per 6 ounces. Choose WIC approved, or under 6 grams of sugar per dry ounce cereals. No flavored milk for under 6. No deep fat frying on site. 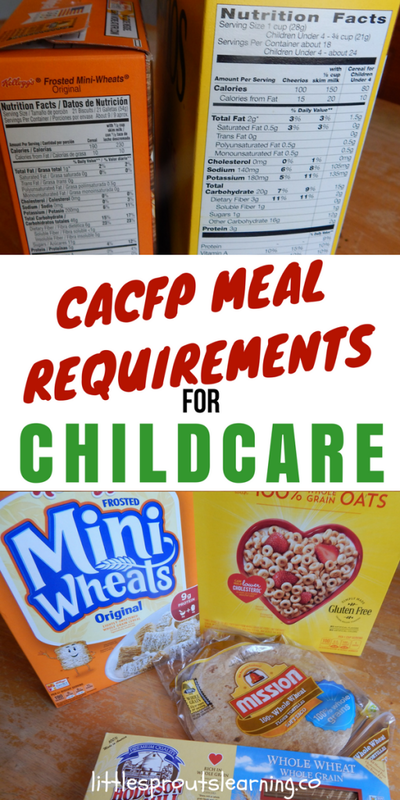 Here are the new CACFP meal requirements for childcare measurements and the old ones. Solid food does not have to be served before age one, but it is allowed after 6 months of age. No juice is allowed for infants. Ready to eat cereals such as Cheerios are creditable for baby’s snack. Infant meat and meat alternatives include lean meats, fish, poultry, cooked dried beans or peas, cheese (no more cheese food or cheese spread), cottage cheese, yogurt and WHOLE eggs. There is a new age group, 13-18 for at-risk after-school programs and emergency shelters. 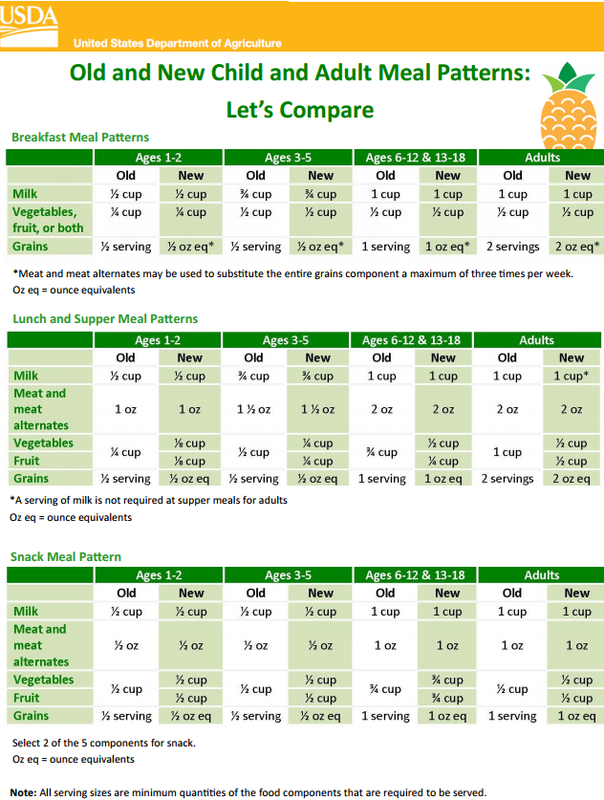 Meal pattern requirements are the same as those for 6-12-year-old. 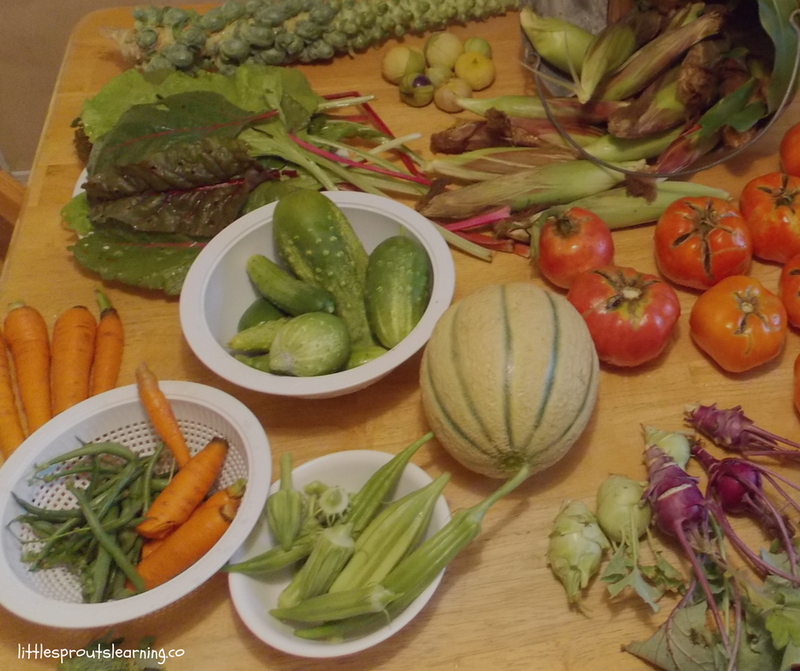 Vegetables and fruit are divided now, so you may no longer serve two fruits for lunch or supper, it must be one of each or two veggies. A vegetable and a fruit are allowed as a snack. Juice is limited to one time daily for children 1 and up. No juice for infants. One whole grain food must be served per day. 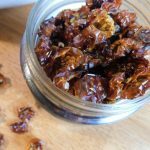 This can be for breakfast, lunch, supper, or snack. This could be in pasta, bread, buns, muffins, crackers, cereals, etc. 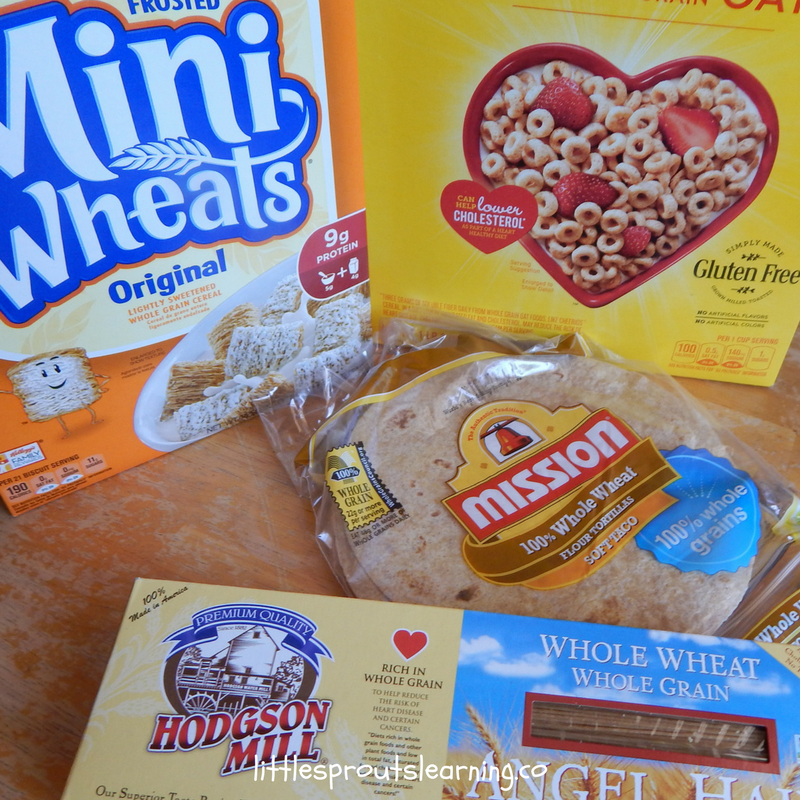 For whole grains, the ingredients must list a whole grain (whole wheat, oats, barley, rice, corn, etc.) as the first ingredient or must be 50% whole grain and 50% enriched grain. One example of this could be if a recipe contains 2 cups of whole wheat flour and 2 cups of enriched white flour. The product could have an FDA whole-grain healthy claim on its packaging such as “diets rich in whole grain foods and other plant foods and low in total fat, saturated fat, and cholesterol may reduce the risk of heart disease and some cancers” Or “Diets rich in whole grain foods and other plant foods, and low in saturated fat and cholesterol may help reduce the risk of heart disease”. You cannot use the whole grain stamp on a product, the criteria must be met as above and some stamped products do not meet it. Providers must document their menu showing whole grains are served, such as whole wheat bread, whole grain-rich, etc. If whole grains are not served, the meal with the lowest reimbursement rate will be disallowed and not reimbursed. All children do not have to be in attendance when the whole grain is served. The rules are once per day for the facility, not per child. If the facility has to close for extenuating circumstances and the planned whole grain meal is not served, the facility will not be penalized for the missed meal as long as it is demonstrated that the meal was planned. If a program only serves snack, that meal must contain a whole grain food. There are many more, this is just an example of some. If you have more ideas, comment below and I’ll add them! No grain-based desserts are allowed. No cookies, sweet crackers, sweet pie crusts, doughnuts, cereal bars, breakfast bars, granola bars, sweet rolls, pop tarts, cake or brownies. Providers may serve them to kids as an occasional treat, but they are not creditable on the food program. **The original requirements stated that graham crackers and animal crackers would not be allowed for reimbursement, however, they have reversed that decision and graham crackers and animal crackers WILL be allowed. Providers can, however, make a dessert such as a pie or turnover and count the fruit in that dessert as a creditable fruit for the CACFP. Grain-based desserts that are homemade are also not allowed either. No homemade granola bars, cookies, nothing. Muffins and sweet breads, however, are allowed to be served including store-bought and homemade. Pancakes and waffles, store-bought and homemade are still allowed and you can add sweet toppings such as syrup. You are encouraged to find healthier alternatives to those, but they are allowed. Bread will be measured in ounces rather than servings for less confusion. Breakfast cereals must contain no more than 6 grams of sugar per dry ounce (21.2 grams per 100 grams of cereal) There is a formula for figuring ounces available, but any WIC approved cereals are allowed because they must follow that rule as well. The formula is: find the serving size in grams at the top of the label and the sugars toward the middle. Divide the total sugars by the serving size in grams. If the answer is equal to or less than 0.212, the cereal is allowed. Best choice: Bran Flakes, Corn Crisps, Frosted Shredded Wheat, Happy O’s, Nutty Nuggets, Rice Crisps and Wheat Crisps. This is not an all-inclusive list, but just an idea to get you started. If you find more that meet the requirements, comment below and I’ll add them! You can click here for a printable WIC sheet you can take to the store with you. You can click here for a calculator to help you figure out if your cereal will qualify. A meat or meat alternate may be served in place of the entire bread serving at breakfast up to 3 times per week. Also, tofu can count as a meat alternate. Yogurt can contain no more than 23 grams of sugar per 6 oz. serving. Any plain yogurt is creditable. Consider buying plain and adding your own sweeteners. 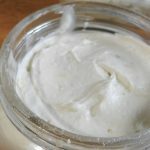 You can use jams, jellies, honey, sugar, maple syrup, fruit, or whatever you have on hand to sweeten the yogurt and you’ll know your plain yogurt is creditable. Click here for a calculator to see if your yogurt qualifies. Children age 1 still must receive whole milk. Ages 2-6 still must receive low fat or fat-free milk. No flavored milk allowed for children under 6. No deep fat frying food on site. Purchased fried foods may be served. Foods prepared on site can be pan-fried, sautéed and stir-fried. Water must be available to children. Food must not be used as a reward or punishment. Providers must encourage moms to supply breast milk. 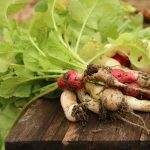 There are also best practices recommended which include: Serving a fruit and a vegetable for snack, providing 2 whole grains per day, serve lean meats, nuts and beans and limit processed meats to once per week, and serve only natural cheese. Check out a side by side comparison of the current rules to the ones that will be implemented in October, 2017 by clicking here. 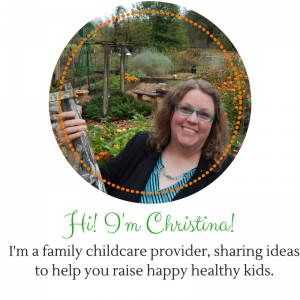 The new CACFP rules are a big change for providers, but anything that is good for the health of the kids in care is a good change. Take each change and think about how simply it could be implemented and you’ll get there one step at a time. For more help on how to get your kids to eat healthy food, click here. For more information for Oklahoma providers, click here. If you have any suggestions to add, please comment below and I’ll be glad to add it! LIfe cereal is creditable, i’m not sure what you mean about butter? I’ll work on that, it’s a great idea. Thank you! I have ditched my deep fryer and have purchased a Chefman “Air Fryer” . There is no frying involved only heat that is surrounding the food just as a convection oven works. I was told by my monitor that it is not allowed as it has the word Fryer in the name. According to the USDA the only thing that is not allowed is deep frying on site. You can serve deep fried foods that you buy frozen, you can pan fry foods and you can use an air fryer. On the other hand, your food program is allowed to have their own additional rules, so if they say no, then it’s no, unfortunately. 🙁 I might call the food program itself and ask if she is interpreting their rules correctly because that sounds like a really good way to cook food. My paperwork says pie crust in a savory dish counts as a grain ( such as pot pie) but pie crust in a sweet dish such as apple pie does not count. That is correct. No more sweet pies are allowed. I am a bit confused on breast fed infants. The minimum requirement is 6 is for 6no infant lunch but I have never had a Breastfed child or mother drink/produce that much for meals. In an older version it States BF infants accustomed to smaller servings can take small servings if more is available on infant will consume it. The latest edition,does not mentioned,and requires a mini.um,of 6 ounces at lunch still. What do we do? I don’t want to stress .oms,asking for larger amounts and most do not want their child or formula either. I’m not sure. I think that would be a question for your food program monitor. Thank you for reading the article and asking though. I wish I knew the answer. I just had my training on Sept. 16th and this question was asked. We cannot force a child to eat/drink and therefore if an infant only drinks 4oz at a meal it would not be considered reimbursable on its own. However if the infant drinks 4oz at 10am and another 2oz at 12pm you can combine those two feedings into one and claim it for the meal. You just need to write down on the infant menu that they drank 4oz at 10am and 2oz at 12pm. That is correct. 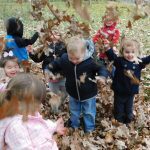 For infants, the time frames are not important, just the amounts.